It was a dizzying climb while it lasted, but the fall has been significant too. Between January 2008 and August 2013, gold prices rose 200 per cent to touch an all time high of Rs 32,943 per 10 gm on August 29, 2013. Since then it has dropped around 20 per cent to Rs 26,645 per 10 gm on September 24 this year. The unprecedented spike - the metal was trading at Rs 11,009 on January 3, 2008 - was mainly due to the global economic downturn that struck later that year, following which investors, seeing all kinds of financial instruments failing around them, sought refuge in gold. The price is now plunging as markets recover from the prolonged crisis. From December 2013, the US Federal Reserve announced tapering off its quantitative easing programme - reducing every month the amount of money it had been pumping into the US economy during the crisis to keep it afloat. The US dollar index has been rising - it rose six per cent between January 2 and September 24 this year - and is currently at 85. Besides, much like the Sensex - which had risen 26 per cent by September 24 on a year-to-date basis - other global market indexes have been climbing too. The US NASDAQ, France's CAC-40, Germany's DAX and Brazil's Bovespa have all risen 10 per cent, 4.4 per cent, 2.78 per cent and 13 per cent respectively during the same period. All these developments have contributed to reducing gold's attractiveness as a safe option. The global gold price too has fallen by five per cent to $1,218 per troy ounce in the last six months - between April 1 and September 24. There are also unmistakeable indications of an interest rate hike by the US in the near future. In its meeting on September 17, the US Federal Open Market Committee increased its median estimate of benchmark rates to 1.375 per cent by the end of 2015, against its own June forecast of 1.125 per cent. Why should this make a difference? "When interest rates rise, so do yields on bonds and cash in the form of money-market funds," says Nitin Nachnani, Research Analyst, Geojit Comtrade. "This makes bonds and cash relatively more attractive to investors than gold, which yields nothing. They transfer capital back into bonds and cash." Demand for gold has also fallen in the two biggest global markets of China and India. Assets under management of gold exchange-traded funds (ETFs) in India were at Rs 7,661 crore at the end of August this year, against Rs 11,828 crore a year ago, down 35 per cent. "Gold has been in bearish mode for much of 2014 due to subdued demand from India and China, no major backup from gold ETFs, the rising US dollar and continued optimism about the US economy in the near future," says Aurobinda Prasad, Research Head, Commodity and Currency, Karvy Comtrade. "The sudden, deeper correction since August is mainly due to the speculation about the US Fed raising interest rates." But the decline is good for the economy. "In recent years, gold imports have been the biggest contributor to the current account deficit (CAD)," says D.K. Aggarwal, Chairman and Managing Director, SMC Investments and Advisors. "The falling price should trigger a much needed shift away from physical savings to financial savings through bank deposits, mutual funds, and insurance which will also help the economy." Indeed, one of the reasons for the decline of gold demand in India was a host of curbs on gold imports the government brought in 2013 in a bid to bring the CAD under control. The import duty on gold, for instance, was raised progressively from two per cent in January 2012 to 10 per cent. It has worked: for the quarter ended June 2014, the CAD stood at $7.8 billion or 1.7 per cent of the gross domestic product (GDP) against $21.8 billion or 4.8 per cent of GDP, in the year-ago period. Gold imports fell to 638 tonne in 2013/14 ($28.7 billion), a drop of 25 per cent from the previous year. At the same time, gold jewellery exports also rose by 10.44 per cent year-on-year to $634.46 million, the government having made 20 per cent export mandatory for importers. In May this year, the government made one concession: it allowed big gold importers, called star trading houses to import gold on credit, which too it had banned in 2013. But demand seems to have permanently dipped. Gold imports rose to 97 tonnes in June, only to fall again to 45 tonnes in July and 50 tonnes in August. Bank of America-Merrill Lynch has forecast in a September report that India's CAD will be 1.7 per cent of GDP in 2014/15, altering its earlier estimate of 2.6 per cent. It does not expect gold import curbs to be lifted in the near future but adds that even if they do go in 2015/16, the CAD will only rise to about 2.3 per cent of GDP. So should investors buy gold or gold ETFs at all? There remain reasons to do so. It can still be a hedge against possible losses in other asset classes. It is still a safe bet during any kind of economic upheaval. 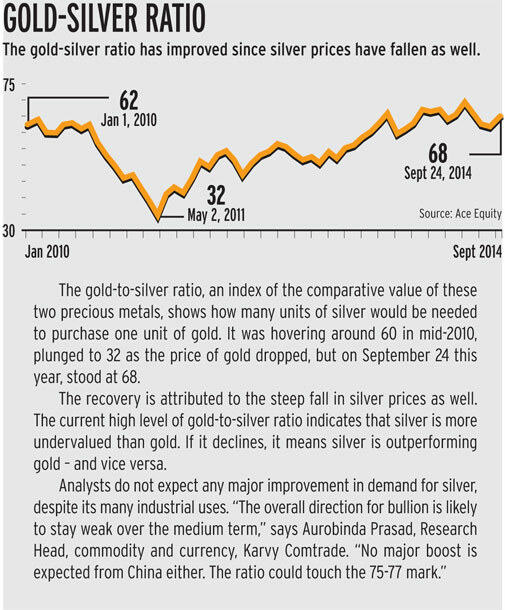 "Geopolitical tensions in West Asia and Ukraine could have their impact on the yellow metal. It is considered a safe haven in times of uncertainty," says Aggarwal of SMC. The bigger question is whether investors should buy now or wait for the price to fall further. Experts are divided on the matter. "The movement of the rupee and the import duty will be crucial in giving direction to domestic gold prices," says Aggarwal of SMC. He expects the local price to remain in the range of Rs 25,000-30,000 per 10 gm and international prices at $1,000 to 1,400 per troy ounce. Prasad of Karvy Comtrade, however, expects a further eight to 10 per cent correction in both domestic and global gold prices. "This could push the gold price on the commodity exchanges down to Rs 24,000-25,000 per 10 gm," he says. "Fresh buying could emerge at those levels over the medium-to-long term."